In Chimamanda Ngozi Adichie’s short story collection, The Thing Around Your Neck (2010), there is a great sense of continuity and wholeness. The stories are tied together not only in a world – ours, now – but also in a literary aesthetic. They flow, like so many paintings in a series. 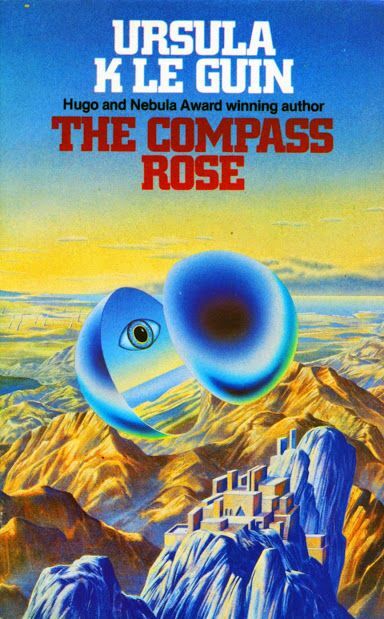 If you were to compare Ursula K. Le Guin’s short story collection, The Compass Rose (1982), to The Thing Around Your Neck, you could make a lot of basic and easily debunked assertions. That the art of the short story collection has come a long way, for instance. That short story collections benefit from being more than just a compilation, a best hits or a value for money, stack ‘em high-type deal. That less is more – Adichie’s twelve to Le Guin’s twenty. I make the comparison because I read both books quite recently, and while the comparison is unfair on a number of levels – Adichie’s writing is literary, Le Guin’s is genre-based; Adichie’s stories span at most a few hundred years and a few countries, Le Guin’s span universes and alternate histories, inventing on a scale that defies the brevity of the short story form – the perfection of one does throw into relief the imperfections in the other. The Compass Rose rattles you. Many of the stories are so short and yet so huge that reading them in succession is like staring out the window of a train that doesn’t stop, and as the train passes station after station without slowing, a person standing on each platform plunges their hand through the open window to tear out a tuft of your hair. The second story, The New Atlantis, wherein a narrative taking place on a deteriorating Earth is intertwined with the almost stream-of-consciousness rising of a primordial, subaquatic species, manages to hint at the majestic whilst remaining totally vexing. It is a testament to Le Guin’s extraordinary mind that she could throw off such a huge idea in just a few thousand words, but pull it off is another matter. When The Compass Rose works, it is because the idea at the heart of the story is simple and Le Guin’s execution is measured. Writers have called the short story form a hand grenade, a single mood and a love affair (where a novel is a marriage), and while the scope of many of the short stories is impressive, the ones that do not alienate the reader by their angular peculiarity are the ones into which Le Guin has put her heart. The best example is the last story, Sur, first published in The New Yorker in 1982. The story is a first-person retelling of the first successful attempt to reach the South Pole. This sounds ordinary until: in this entirely plausible version of history, Roald Amundsen was not the first to reach the Pole. Your narrator, a woman, and her crew, also women, performed the feat several years earlier, the difference being that they were just so happy to have made it there that they didn’t think to brag about it, least of all once Amundsen had come back thinking he was the first, because disavowing him of that notion would have embarrassed the poor man. The warmth and baffling conscientiousness with which Le Guin speaks through this imagined pioneer is both believable and endearing, and the time she takes to detail the gruelling struggle of accomplishing such a feat is just as gripping and mundane as one would imagine any pioneer’s diary to be. It is possible, given Le Guin was in the prime of her sci-fi and fantasy writing career, that no editor would have said to her at the time, ‘Go write eleven more Surs and we have ourselves a collection.’ Her fans were going to buy the book anyway, and publishers would certainly have known it. Now, however, possibly for that reason, it does not merit the recommendations that I would unthinkingly offer The Left Hand of Darkness, The Lathe of Heaven, and A Wizard of Earthsea. Le Guin would probably object to the idea that genre-based writing could not ALSO be literary writing. Yep, I agree, she would. In fact, so would I. I chose to say her writing is “genre-based” (instead of just calling her a straight “genre” writer) because if anyone has ever straddled that genre-literary divide, working from one into the other, challenging conceptions of what should be considered literary, it’s Le Guin. Nevertheless, she’ll always be classified first and foremost as a genre writer, however reductive that is. I didn’t, however, mean to imply that they are mutually exclusive — quite the opposite. So, slap me on the wrist, I suppose. That’s what I get for writing a review at 9:30pm after two beers. I think authors of Le Guin’s stature have earned the right to write about something outside their genre — as Doris Lessing did (not very successfully) and Margaret Atwood continues to do (very successfully). It doesn’t always work, but it is always interesting. Actually, I meant that comment on the quality of ‘Sur’ to be a reflection on its quality, rather than its subject matter, genre or form. I think all of the stories are well within the realms of what Le Guin had tried before, even if the specific ideas are new. There’s a sense in ‘Sur’, perhaps because it went through The New Yorker’s editorial process, that it’s really been worked on. There’s an earlier story, ‘Two Delays on the Northern Line’, which was also originally published in The New Yorker, and while I prefer ‘Sur’, the difference is notable in that story too. It’s not that the other stories included were a waste of time, or failed experiments, but that they feel under-cooked. Point being, I don’t think ‘Sur’ benefits from being a certain ‘kind’ of story. It benefits from having been worked and reworked by an editorial team with different priorities from those that were likely to have existed in publishers catering to 1970s and ’80s sci-fi and fantasy audiences. Or at least that’d be my rather uneducated guess.